2013 NCAA basketball - Who from France may dance in March? With March approaching, the NCAA Division 1 basketball regular season is drawing to its conclusion. This year 345 teams are battling for the 64 places in the tournament final, the Big Dance. March Madness kicks off with 30 conference tournaments with the Ivy League as the only conference that does not have a post-season tournament. Here is a short explanation of the college hoop system: having the most wins in a conference doesn’t necessarily mean qualification for the NCAA tournament. Only the winners of each conference tournament secure the "automatic bid" to the tournament. The remaining teams are granted "at-large" bids, which are extended by the NCAA Selection Committee. All stats are as of 18 February 2013 with three French players already having the right to order their dancing shoes: Jodie Cornelie-Sigmundova (Dayton), Wilka Montout (South Carolina) and Allison Vernerey (Duke) because their colleges are highly ranked. 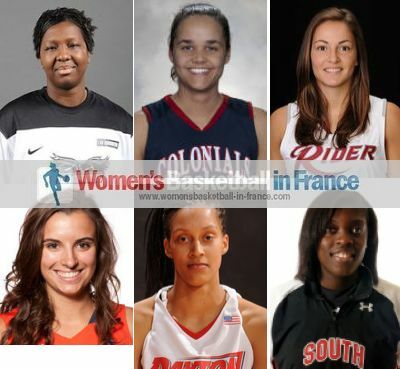 This season 2012-2013 sees six new faces from France playing for Division 1 colleges. Manon Pellet who missed last season with an ACL injury is at Rider University. She has participated in 22 of the 25 games played so far this season making 4 starts. Rider are currently 4th in Metro Atlantic Athletic Conference (MAAC). Mathilde Hergott who was a team-mate of Pettet at Montpellier is at the University of Texas at San Antonio (UTSA). So far she has played in 10 games and her team is in fourth place in the Western Athletic Conference (WAC). Lou Mataly is playing at Robert Morris and has started in 13 of the 19 games she had played. Her team have a rough time this season and need to win their conference title for any hope of post-season play. The last freshman for this season is Jodie Cornelie-Sigmundova, her college Dayton has lost just one game (22-1) all season and is in the top 25 in the national rankings. They lead the Atlantic-10 Conference with a perfect record (9-0). Cornelie-Sigmundova who has not started in any of the 22 games she has played in is likely to be the only freshman from France dancing in March based on all the teams' current form. Fanny Cavallo and Wilka Montout are junior players (in their third year) despite this being their début season in the NCAA. Cavallo is at Long Island University (LIU Brooklyn) and has played in all 22 games making 11 starts. However with just 5 wins this season, and only 2 in conference play LIU may fail to qualify for the NEC tournament. Montout is playing for South Carolina Gamecocks in the SEC conference. Her team have had a good season so far with a top 25 ranking. They have a 21-5 record and are 6th in the conference. However with the SEC normally having 7 or 8 teams at the Big Dance, Montout can order her dancing shoes. She is yet to start a game this season but has played in 23 games. Allison Vernerey's NCAA basketball career has seen her play in three National Elite 8 games and she will be back in the battle for the title this season. Duke are ranked 5th in the nation and have won 24 games and dropped just once. More importantly they are a perfect 14-0 in ACC conference play. For Vernerey the only setback was the end of her 111-game playing streak last December when she had to sit out one game with an elbow injury. For the three other seniors the only chance of joining Vernerey in the Selection Monday (draw for the Big Dance) is to win their conference tournaments. For Tamzin Barroilhet and Kent State, only a tournament victory can extend their season. Katrin Chiemeka and Davidson College are currently second in their conference and still have a chance of a post season. For Najat Ouardad and Aubern things have become complicated in the SEC conference as they occupy the 11th place in a 13-team conference. If they do not improve their ranking or win the conference title there may be no post season again for Ouardad. Christelle Akon-Akech who is a junior at Fairfield University is hoping for better luck this year. Her team are currently second in the MAAC conference. Last but not least Esther Niamké-Moisan, aka Monny Niamke, transferred to Louisville and is sitting out the season. But her team are likely to participate in the Big Dance. 18 February 2013 2013 NCAA basketball - Who from France may dance in March?